A market research mind map example drawn with the Edraw Mind Map software. With this easily customizable mind map template, users can present any topic from many perspectives. 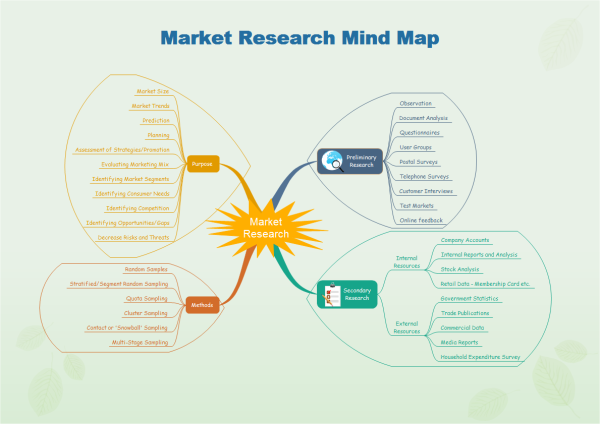 This Market Research mind map template shows how to do market research. It can save many hours in creating mind map by using built-in symbols and automated mind map software. You can download and modify the mind map for your own use. This kind of mind map is commonly used to organize ideas. Download and use it as a template for your own mind map designs. You can use mind map like this to make personal profiles. This novel and practical style will surely impress your employer. Discover why Edraw is an excellent program to create market research. Try Edraw FREE.